Aranow got her start in clothing in New York in 1967 when she opened Dakota Transit. 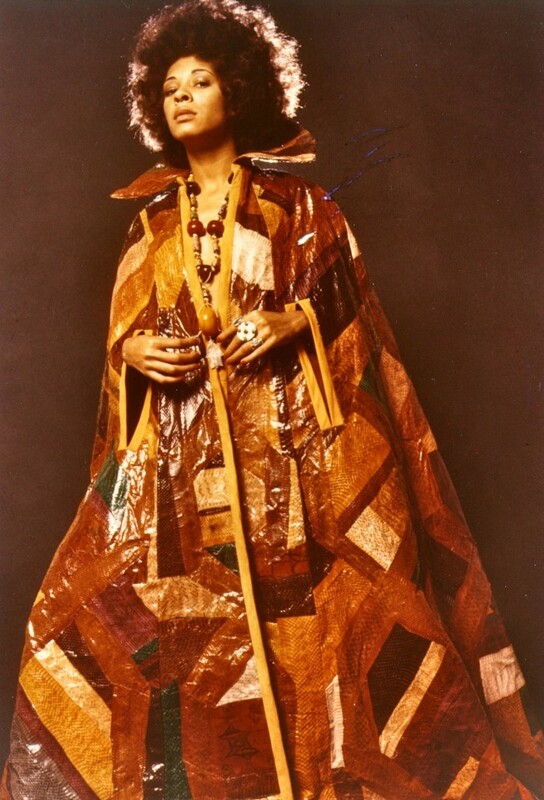 There, her handmade leather and snakeskin garments gained the attention of high profile clients like Jimi Hendrix and Betty Davis. When Aranow lived in Peru, doing cultural research for a museum in the 1970s, she became interested in collecting handwoven and industrial fabrics. She traveled in South America, the Middle East, Europe and Asia, often with her two young sons, acquiring fabrics for museums and her own collection. That work grew into what is now one of the largest private textile archives in the world. While Aranow is still consulting in New York, Sayan moved the collection to Portland, OR and started building Textile Hive. When Sayan began digitizing the archives, he had little knowledge about building an online research tool of this scope and size. Sayan tried finding examples of archival terms and taxonomies to work from. He looked at the cataloging system used at The Textile Museum in Washington D.C., but it wasn’t a good match. Sayan and his team landed on a taxonomy with over 19 categories, like culture, era, embellishments, and luminescence, and over 2300 terms. Sayan built custom software to create the experience he had in mind. “I view the application itself as an augmented tool for interacting with the collection,” Sayan said. Users have different access points into the collection including by place of origin on a map or by cultural aesthetic. Another search tool pins textiles side by side for comparison (shown above). One cool feature brings researchers into the space, where they can browse virtual drawers and shelves that correspond to the physical archive. Textile Hive was created for art historians and fabric lovers, but would delight anyone with an appreciation for beautiful objects. “I wanted to show how this collection is different from a museum collection, in that it had a point of view and was personal,” said Sayan. The finished product is a multi-layered application, as unique as the archive it was born from. Watch a short video about Andrea Aranow and the digital collection here. Images courtesy of Andrea Aranow Collection/Textile Hive.